There are only two weeks left to prepare your submissions for the “Do You Hear the Call?” Open Photo Competition! The competition will recognize outstanding photographic images featuring themes of nature, wildlife and the environment. Enter for a chance to win the $500 Best in Show award! Amateur and professional photographers 14 years of age or older are welcome to submit up to two works in the competition which will be juried by award-winning Michigan photographer Monte Nagler. Dearborn residency is not required to enter this competition. Entry fees are $15 for one entry or $25 for two entries per artist. Works must be delivered on April 28, between 2:00 and 6:00 p.m. to Henry Ford Centennial Library. 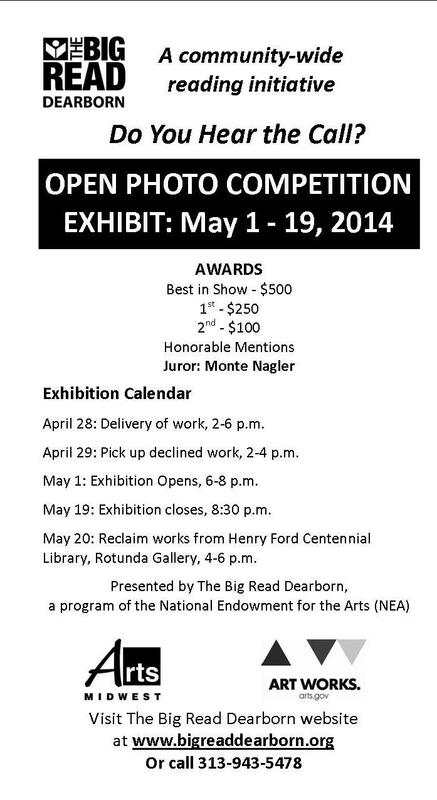 Selected works will be exhibited at the Library from May 1-19, 2014. For additional details about preparing and delivering entries for submission in the competition, download the entry form, pick up an entry form at any Dearborn Public Library location or the Ford Community & Performing Arts Center, or call 313-943-5478.